Kwame Kilpatrick served 99 days in jail for his 2008 perjury charges, but it wouldn’t be his last time behind bars. 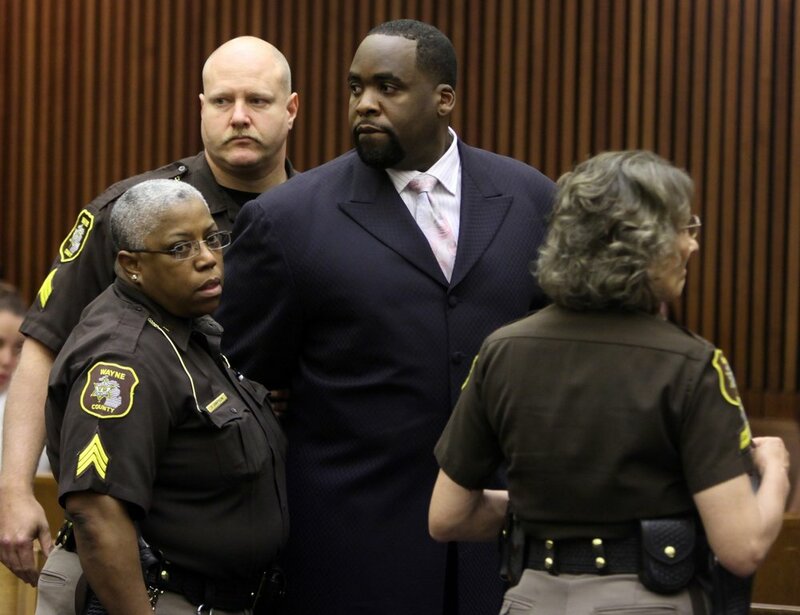 Here, Kwame Kilpatrick is handcuffed after his sentencing by Judge David Groner in May 2010. Courtesy of the Detroit Free Press. Kwame Kilpatrick had to watch Barack Obama’s 2008 presidential victory speech from county jail. The two had crossed paths several times, including in 2007, when Obama visited Detroit to speak at an Economic Club forum. Courtesy of the Detroit Free Press. After pleading guilty to perjury charges related to his testimony in the Gary Brown whistleblower lawsuit, Kwame Kilpatrick served a 99-day jail sentence. This is the view from outside his cell window at the Wayne County jail in Detroit. Courtesy of the Detroit Free Press. Kwame Kilpatrick was released in February 2009. He left for Dallas, Texas, where his family had relocated while he was behind bars. Courtesy of the Detroit Free Press. Kwame Kilpatrick is sentenced by Judge David Groner on Tuesday, May 25, 2010. Kwame was sentenced to up to five years in prison for his failure to pay restitution to the City of Detroit, which was part of his original plea deal. Courtesy of YouTube and the Associated Press. Kwame Kilpatrick was released from prison in the early hours of the morning to avoid media attention. Courtesy of Tim and Tobias Smith. The day Kwame Kilpatrick is released from prison in 2011, his mother, Carolyn Cheeks Kilpatrick, left, hosts a party to celebrate. Courtesy of Tim and Tobias Smith. Reporters gather outside of the home of Carolyn Cheeks Kilpatrick on the day of Kwame’s release from prison. Courtesy of Tim and Tobias Smith. 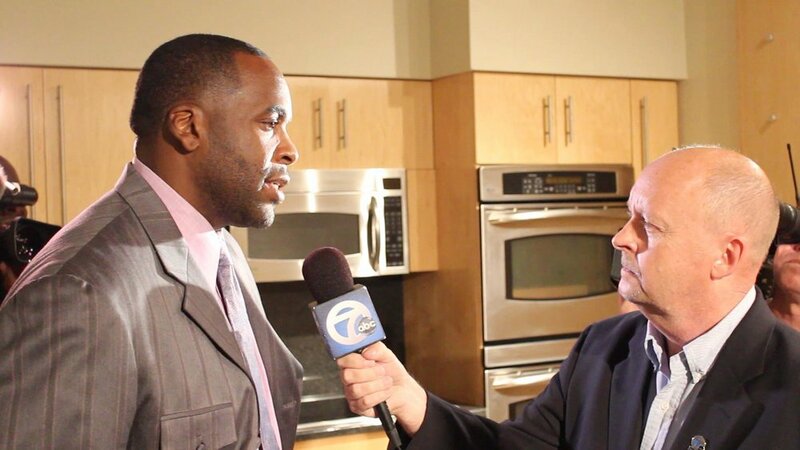 Kwame Kilpatrick continued to face media scrutiny regarding the lifestyle he enjoyed in Texas, and the ways his tumultuous tenure as mayor impacted Detroit. Courtesy of Tim and Tobias Smith. Kwame Kilpatrick at a book signing for his 2011 memoir, “Surrendered: The Rise, Fall and Revelation of Kwame Kilpatrick,” which he co-wrote with his cousin-in-law, Khary Turner. The city ordered that profits from the book sales be put in an escrow account, to help pay out Kwame’s remaining restitution obligations. Courtesy of Tim and Tobias Smith. Crimetown is Marc Smerling and Zac Stuart-Pontier. This season is made in partnership with Gimlet Media and Spotify. This episode was produced by John White, Soraya Shockley, Rob Szypko, and Samantha Lee. The senior producer is Drew Nelles. Editing by Zac Stuart-Pontier and Marc Smerling. Fact-checking by Jennifer Blackman. This episode was mixed, sound-designed, and scored by Sam Bair. Original music this season composed by Homer Steinweiss. We recorded some original music at Rustbelt Studios in Detroit in partnership with Detroit Sound Conservancy. Special thanks to Carleton Gholz and Maurice “Pirahnahead” Herd. Additional music by John Kusiak, Kenny Kusiak, and Jon Ivans. Additional mixing by Bobby Lord. Our theme song is “Politicians In My Eyes” by Death. Our credit music this week is “Politicians In My Eyes,” covered by the Dirtbombs. Archival research by Brennan Rees. Some of the audio in this episode appears courtesy of Tim and Tobias Smith, and their film KMK: A Documentary of Kwame Kilpatrick. Additional archival material courtesy of WXYZ. Show art and design by James Cabrera and Elise Harven. Thanks to the Detroit Free Press, Peter Bhatia, Jim Schaefer, Mary Schroeder, Melanie Maxwell, Mary Wallace, Elizabeth Clemens, Max White, Randy Lundquist, and everyone who shared their stories with us. Detroit’s an amazing place, and we’re honored to tell a small part of its story.